Three years ago, I sat among a group of fishermen testifying before the New England Fishery Management Council that the new catch share program was not working and needed to be fixed. The fleet was consolidating, access was becoming unaffordable to owner-operators, and inshore fishing areas were coming under increased pressure. Several council members and lobbyists, who supported catch share ideology, denied these problems. Not surprisingly, they have yet to be fixed. Advocates of the catch share approach promised higher prices to fishermen, better stewardship over the ocean, and a general improvement in fishermen’s livelihoods. Instead we’re seeing an unaffordable quota leasing market where Georges Bank cod (east) leased last year for an average cost of $2.48 per pound while the average ex-vessel price to the boat was $1.08 per pound. We’re seeing non-owner-operator companies control upwards of 23% of a single fish species. Younger fishermen can’t afford entry into the fishery. And, the program has created an incentive to shift effort to nearshore waters, leaving inshore-dependent fishermen without fish to catch. These problems aren’t unique to New England. In fact, many fishermen and researchers predicted these outcomes. Back in 1990, the first US catch share program began with individual transferable quotas in the surf clam and ocean quahog fishery. In a few short years, the fishery, which previously had supported many owner-operators, was transformed into one dominated by just three multinational corporations. Last year, Lion Capital, a British private equity firm, paid $980 million to acquire Bumble Bee Foods and Bumble Bee’s subsidiary Snow’s Inc., which included exclusive property rights to 23% of US surf clams and ocean quahogs. Similar patterns can be seen in Iceland, New Zealand, Namibia, and many other countries around the world. In the case of Iceland, the catch share program did nothing to rebuild fish stocks but undermined fishing community infrastructure and jobs. Fishermen there were so outraged that they took their grievances all the way to the United Nations (UN) Human Rights Committee, and they won. In 2007, the UN ruled that privatization violated the International Covenant on Civil and Political Rights. Soon afterwards, the Icelandic government began a process to dismantle the program. The broad strategy of implementing catch shares is ideologically driven and backed by a unique alliance of conservative, free-market advocates, as well as foundation-funded environmental groups. $20 million in 2012 for the sole purpose of promoting catch share programs with an explicit goal of commoditizing seafood into a global market that values high-volume, low-value “efficient” fisheries – the same ones that charge a fisherman $2.48 a pound for the rights to fish and pays them $1.08 a pound for that fish when they bring it to shore. It’s no wonder the fishermen keep saying, “We need more fish.” If you were told the only way to make ends meet is with volume, not value, what would you do? As I’ve written elsewhere with University of Rhode Island Professor Seth Macinko, the core assumption of catch share ideology is that if we turn fisheries access into private property, then we’ll take better care of the fish. The problem, of course, is that US fisheries already have an owner – the American public. The idea that private owners will automatically act as stewards to preserve their assets was proven dramatically naïve by the world financial crisis of 2008. Why should we assume now that what is bad for banks will be good for fish? Others who defend catch share ideology include the Koch brothers and the Charles Koch Foundation, which have teamed up with organizations such as the Environmental Defense Fund to heavily fund campaigns to promote catch shares. With pressure and financial backing like that, it’s no wonder fishermen and their allies in New England face such extreme resistance when seeking policy fixes to very clear problems that affect both the health of the ocean and fishing livelihoods. An increasing number of brave fishermen, council members, and others continue to shed light on the problems associated with catch shares and offer solutions, including limits on quota accumulation, safeguards for inshore fishing areas, and more transparency on ownership trends. However, we’re hearing more and more about backlash from catch share supporters, where vocal fishermen are cut out of the leasing market, bullied on the water, or socially ostracized. Amendment 18 to the groundfish plan, the main policy vehicle to fix things, will be discussed during the New England council’s Sept. 30-Oct. 2 meeting in Hyannis, MA. National Marine Fisheries Service announcing the heart-wrenching news that the cod catch would be cut to disastrously low numbers. In typical fashion, likening it to a tsunami that surely would take out the entire fleet, some council members used that news as a reason to delay dealing with Amendment 18. Today, we’re receiving more bad news about cod stocks and already these council members are making similar claims to avoid consideration of reform proposals. But, the real tsunami is a global strategy to transform fisheries policy from publicly managed access into privatized property, effectively displacing independent family fishermen, putting enormous pressure on the marine environment, and ultimately turning fish into commodities for the international market. We in New England can tip the scales away from policies that privatize the public commons and consolidate the fishing industry. For the sake of current and future generations of fish and fishermen, the council must proceed to a vote on Amendment 18 to identify the best alternatives to a flawed system and protect the fisheries as a public trust. Brett Tolley is a community organizer for the Northwest Atlantic Marine Alliance (NAMA) and coordinator of the “Who Fishes Matters” online blog, which can be found at <http://whofishesmatters.blogspot.com>. 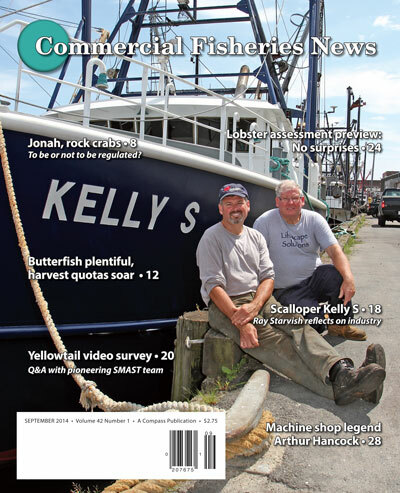 Read the rest of the September issue of Commercial Fisheries News – right now! Access the complete issue using our online flip-book and also download a .pdf copy for future reference.